Sometimes the right collaboration can make a BIG difference in your business. That's exactly what happened with Starship Captain Jill Maldonado (of Material Rebellion) and her friend, Linda Ruel Flynn (of Flora-Ly). They met almost by chance and have built their relationship into a partnership based on mutual respect and equal levels of enthusiasm. Read on to hear their story. Linda: I preserve flowers and create custom botanical collages that will forever connect you to a time, event, person or place that otherwise would feel lost in the past. How did you start working together? We both belonged to an artisan group here in Western MASS and really connected at a holiday party over our frustration about feeling stuck in our businesses. Jill: I felt like I’d been trying to have this conversation over and over again with every maker I met. When I talked with Linda, I finally felt like someone was speaking my language. Jill: Even though I didn’t know Linda well, personally, I knew that I respected her work and I felt like we had similar goals for our businesses. I was thrilled at the idea of meeting and talking with her more about what we were each trying to do. HOW do you work together? Where do you meet? What do you discuss? Jill: Because we didn’t know each other well at the time, we started with a fairly formal structure. We met once a month in a café that was a midpoint between our homes. (We actually live two hours away from each other!) We’d be very careful to dedicate an equal amount of time to each other’s business. We discuss anything and everything! Sometimes we’re looking at broad strategies- branding, targeted customers, what space we occupy in the market. Sometimes we’re super-focused on tactics – this photo, that font, this copy, those print materials. It’s very flexible and bends to each of our needs in the moment. Linda: We joke that the barista our third partner in business! We start with breakfast and end with lunch. We found the perfect cafe where they don’t give the evil eye for sitting for up to 4 hours at at time. I really appreciate our HOW. We have come to a very fluid place of give and take. Not only the day of discussions but the follow-up that happens. We don’t let topics drop just because we aren’t sitting across from each other. Do you have a schedule or a plan ahead of time, like the specific questions I ask in the Starship weekly chat? A few days before we’re going to meet, we’ll email each other with a general idea of what we each want to talk about, along with any pictures, links to articles, podcasts or videos that will help the other prepare for the discussion. By preparing ahead of time, it makes us better able to use our time together effectively. We also give ourselves as much time as possible for our meetings. By setting aside several hours, we’re able to dive very deeply into each other’s work. This means, if one of us is struggling with writing website copy or forging a new brand identity, we can do actual work together with long silences while we both focus on the problem. Or, we can go through several iterations of an idea in one sitting, getting up to stretch or (of course) get more coffee. Now, nearly two years later, our working relationship has become more intuitive and less formal. We reach out to each other a lot through text, email and phone with little questions or worries that we’re looking for support on. We get together at LEAST once a month, sometimes more. Sometimes these are long, working meetings and sometimes they’re just quick catch ups. We’ve added a new element of putting our strengths and skills to work for each other on bigger projects. Jill: For instance, when I wanted to take my website to the next level and Linda decided I needed photos of kids using my products, she not only found me a model, but she created beautiful black and white paintings to use as set pieces. We worked out the concept together, but she was able to execute it in a way I never could have. (You can see the paintings from the shoot here.) Now, as I’m designing and building my first trade show booth, Linda is again right there with me as we work out the concept and she creates her amazing paintings. They’ve become a big part of my brand identity. Linda: In tandem with that I am laying the groundwork to push my work out on a broader geographic area. I knew that would involve customers having to ship their wedding flowers to me. 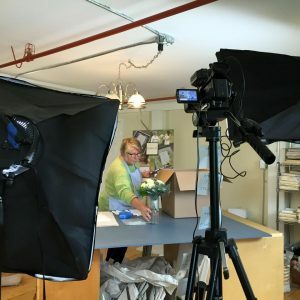 I needed a How To Pack Your Flowers video. Jill, with an enthusiastic Yes! and her trusty BFA from NYU film school, came to my studio for a day to shoot video. Not only that, she is editing and will hand me a finished product for my website. This is a huge step for my business that would have happened much further down the road if it had not been for Jill. Another exciting thing we’ve started doing is a quarterly retreat. We’ll get an inexpensive AirBnB in a central location and take 2-3 days away from family and the daily grind of our businesses to power through some big stuff. With that much time, we can work side by side on our own thing and stop to get opinions, work out issues, work on each other’s things. It’s pretty amazing. Linda: At about 10pm on our first night away Jill looked over and said, ‘Can I have at your website?’ Absolutely! By 2 am she had cleaned up, re-written some copy, created Book Now buttons and all around made it the lovely website it is today. I appreciate the level of trust we have created. What lessons have you learned from working together? Jill: I’ve learned the power of letting someone else help. It can still be hard to ask for help because I feel like I’m taking up Linda’s time or taxing her talents for my own benefit, but I’ve realized that I have a lot to give too. Sometimes we take our own gifts for granted because they’re the things that come easily to us. By working with Linda, I’ve come to a better understanding of what my own strengths are. For absolute sure, by working together we have both moved our businesses further, faster and better than either of us ever could have done alone. We like to say that we move mountains together. I love that idea. Although, I tease Linda that now, through the work we’ve done together, I feel that we don’t need to push against those mountains anymore, but we’re soaring over them instead. Linda: I have learned I am not an island. As a person without siblings, alone has always come easily to me. I don’t seek the company of others for the heck of it. But working with and becoming friends with Jill has really brought home the power of complimenting resources. We are much stronger together than apart. What are you most enthusiastic about right now? Linda: I’m excited for Jill’s trade show!!! She has approached this with such depth that I just can’t wait to see what happens. Her message and commitment to her vision and product inspire me. I’m also excited for the upcoming changes in my business. Casting a wider net has me thinking more about my website, my product offerings and my message. Taking my business to a demographic that is new to me is terrifying but so necessary. Jill: I’m enthusiastic about watching Linda take a local, 2nd generation business, pivot it to make it undeniably hers and reach out to a national market. I’m enthusiastic about my first trade show too! Actually, it’s the thing I’m most terrified about at the moment! I’m excited to strike out into the wholesale market with a strong brand, a cohesive product line and a beautiful booth that embodies everything I’ve been able to achieve through this co-working, synergistic, accountability partnership. Thanks, Linda! What should other business owners look for in a potential accountability partner? Don’t worry about working whether or not your potential partner works in a similar industry or has a similar business. It’s almost better to work with someone in a totally different area. That way there’s absolutely no competition and you each bring a fresh set of eyes that might more easily spot faulty assumptions you’ve been making about how or why you do things in your business. The most important thing is that you both have a similar vision for where you want to take your businesses. For instance, if you want to build a global brand and someone else wants to build a business doing retail craft shows that brings in extra money for groceries, those are both great, legitimate businesses to build, but you might be better able to help each other if you have your eyes on the same horizon. To go back to the analogy we use about moving mountains, it helps if you and your potential partner both want to move the SAME mountain. You also want someone who approaches the relationship with a generosity of spirit that matches yours. You will both benefit from the help you give each other. Linda: I can’t say enough about the generosity of spirit. There is no score keeping! When two people bring open hearts, skill sets and the sense that WHATEVER is talked about and worked on will benefit you both, you can’t go wrong. 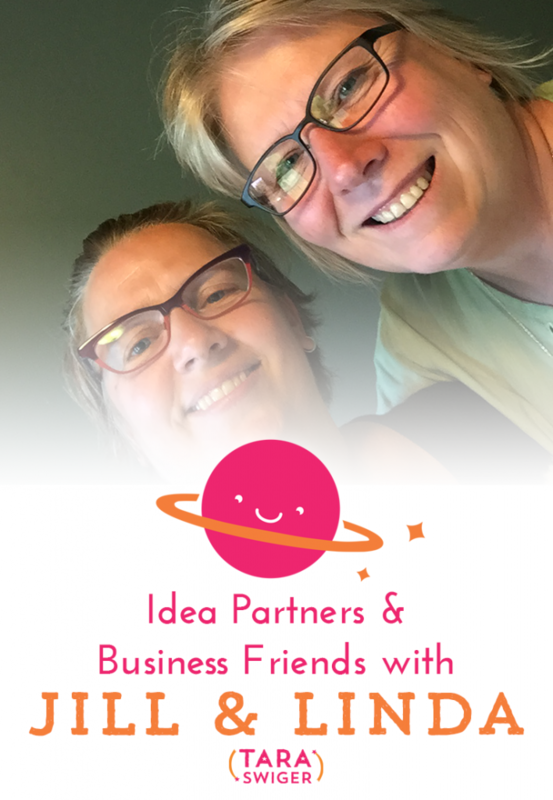 Jill and Linda met outside the Starship, but we've also got an Accountability Partner program on the inside, as well as the option to connect + collaborate with other business owners through the forums, weekly chats, and more. If you think this type of partnership and accountability could benefit YOUR business, you're in luck! The Starship is now open – click here to learn more. Want to learn more about how you can find and use collaborations and business friends? Join us for the free workshop this week! Sign up to get access to the free webinar! Success! Now check your email to confirm your details! I'll email you the day of the webinar, so you don't forget!